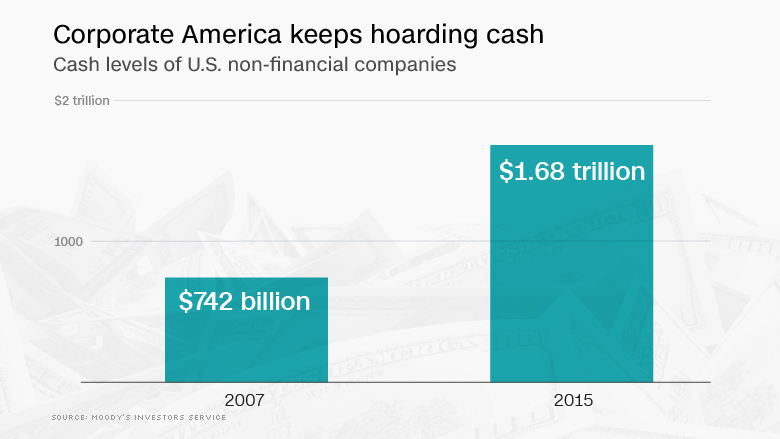 Corporate America's cash stockpile keeps growing. U.S. companies held $1.68 trillion in cash last year, up slightly from last year and more than double the corporate cash stockpile in 2007, prior to the Great Recession. Moody's Investor Service, which published the list found that Apple (AAPL), Microsoft (MSFT), Google (GOOG), Cisco (CSCO) and Oracle (ORCL) led the way among the 1,000 companies included in the analysis. Financial companies were left out from the tally. Together those top five tech companies hold $504 billion, or 30% of the total amount held by corporations. 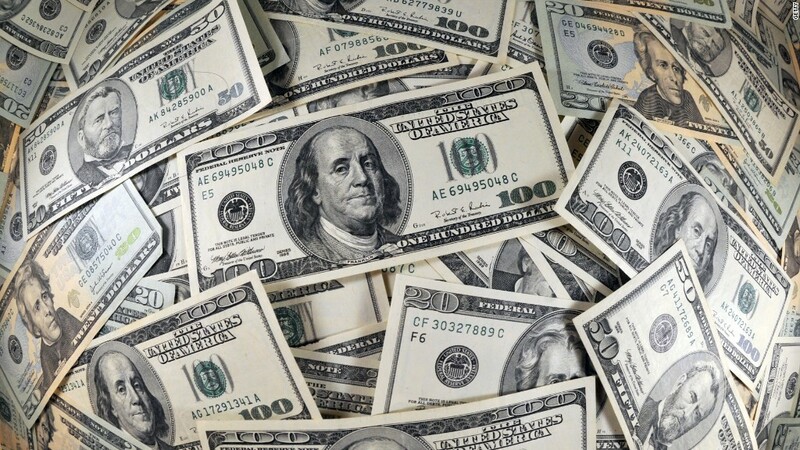 Of the total $1.6 trillion, about 72% of the cash is held overseas, untaxed by America. That's the part that infuriates lawmakers and presidential candidates. American corporations left and right are deciding to keep their earnings overseas to avoid paying steep corporate income taxes when they bring it back to the U.S. The taxes can be as high as 40%. As multinationals create more jobs overseas, the issue has become a hot button on the 2016 campaign trail. The trend of keeping the cash abroad isn't likely to turn the corner soon, Moody's notes. "We expect that overseas cash balances will continue to grow unless tax laws are changed to encourage companies to repatriate money," according to Moody's authors Richard Lane and Lenny Ajzenman. Apple had $200 billion held overseas last year, up from just $31 billion in 2010. It keeps some of its cash in tax havens like Ireland. Apple CEO Tim Cook outlined the problem in December when 60 Minutes correspondent Charlie Rose pressed him on why he doesn't bring all that cash back to the U.S. He called criticism from Congress "total political crap." "I'd love to," bring the money back, he said. "It would cost me 40% to bring it home. And I don't think that's a reasonable thing to do." All this cash is also a sign that companies aren't using their cash to invest in the future, whether it's to fund new projects and ideas or buildings and facilities. Capital expenditures decreased last year after increasing for five consecutive years.